Mumbai, India (May 12, 2017) – INOX Leisure Limited, India’s premier multiplex chain, is taking the movie viewing experience to a brand new dimension. Soon after launching India’s first Laserplex at Nariman Point, Mumbai, INOX launched yet another 7-star cinema experience sprawling 58000 square feet in R City Mall at Ghatkopar, Mumbai. The new 9-screen multiplex, designed for the genuine film connoisseurs, was launched by Bollywood Superstar, Shah Rukh Khan. Conceptualized by award winning architects Mesbur Smith & Associates, the 9-screen multiplex boasts of the latest technology one can imagine today, and more. Equipped with an IMAX screen, India’s first and only laser projection format with 300% enhanced picture quality, explosive Dolby ATMOS sound, stunning life-like 4K resolution and Volfoni Smartcrystal solution for the brightest 3D projection, INOX at R City is where movie viewing moves to untouched boundaries. – Interactive automated Box Office – One can browse, choose and pay for tickets on the interactive screen, which mirrors on the opposite side, where an Office Assistant can assist, if needed. – Interactive menu – The interactive touchscreens in the concessions area help one to browse through the menu, while ordering food and beverages. – An enthralling 550 square feet LED video wall in the lobby with full color, ultra-bright, full motion dynamic real-life like content display, is the largest in any theatre. – An interactive gaming zone powered on a huge LED touchscreen. R City additionally houses INSIGNIA, INOX’s signature experience, which is the last word in luxury cinema entertainment. With INSIGNIA, guests enjoy a gourmet menu curated by master Chef Vicky Ratnani, butler-on-call and service by staff dressed in designer uniforms by Arjun Khanna, among other features. It also has KIDDLES, a fun zone for the tiny tots. This space in the lobby is for young children to spend time playing games and engaging in some creative activities, before the movie. Live the Movie With INOX in R City! INOX Leisure Limited (INOX) is India’s premier multiplex chain with 119 multiplexes, 472 screens spread in 58 cities. 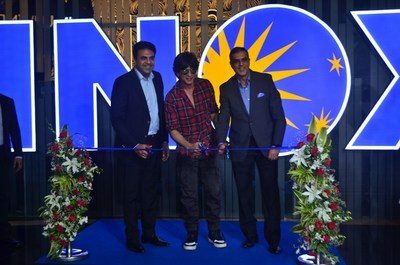 A pioneer in adopting latest technologies, INOX recently announced the launch of India’s first 7-star experience and the country’s first Laserplex in Nariman Point, Mumbai. For easy and convenient ticket booking, INOX offers online booking on http://www.inoxmovies.com and through its smartphone applications. For movie updates and various offers, one can follow us on Facebook (http://www.facebook.com/INOXLEISURE) Twitter (http://www.twitter.com/INOXMovies) and Instagram (https://www.instagram.com/inoxmovies/).